No Port Renfrew fishing to report today....cold, windy, and surf's up! There's a South Vancouver Island salmon fundraiser coming up. It is a dinner and auction, the website link details last year's event. This is the organization that gets the funds from the salmon stamps on our licenses and pursues salmon conservation projects, so it's for a good cause. Over 190 species of plants and animals depend on salmon: from algae and mosses to bears, whales and people. For salmon to survive and thrive, these genetically diverse fish need access to healthy habitat, food, good water quality and enough water in streams. Achieving healthy, sustainable and naturally diverse Pacific salmon stocks requires time, money and dedicated people. In the past 20 years, through several programs, PSF has filled, and continues to fill, many of these needs. PSF continues to raise funds and direct funding to grassroots, volunteer and community driven projects focused on the conservation and recovery of Pacific salmon. PSF supports research and science, then integrates this knowledge into program plans at the community and watershed level. PSF works with First Nations, private companies, educational institutions, non-profit groups, all levels of government, and commercial and recreational anglers to bring salmon back to our streams. PSF was founded as a non-profit charity in 1989. The Community Salmon Program was soon implemented through part proceeds of the newly created DFO Salmon Conservation Stamp. This was the beginning of a 20 year relationship between the Department of Fisheries and Oceans, PSF and BC communities. PSF's work over the past 20 years demonstrates clearly that investing in people, communities and capacity is the key to ensuring healthy, sustainable and diverse salmon populations today and in the future. 2006 saw PSF embark on a large multi-year initiative called the Fraser Salmon & Watersheds Program. With funding from the Provincial Living Rivers Trust, Fisheries and Oceans Canada, the Pacific Salmon Endowment Fund Society, and in partnership with the Fraser Basin Council, PSF leveraged this support and initiated several new alliances with corporate and individual supporters. Today, PSF is working on inspiring behavior change for the benefit of salmon through the Fraser Salmon & Watersheds Program. We are playing a key role in the development of policy and salmon management in the greatest salmon watershed in the world. We are striving to be a strong supporter of innovative science and we continue to build on the impacts we have had conserving salmon. We are now working to target how people in their everyday lives can support salmon and their watersheds. Our combined efforts have created ripples that extend beyond tomorrow. We can help salmon survive and thrive, and you can help. Hope to see you at the event -- help support BC salmon conservation! Our first report of 2009…Happy New Year to the many friends of Port Renfrew Fishing Adventures around the world. 2008 ended with some drama in Port Renfrew, not so much for fishing, but for weather…more snow than anyone has seen in a long time! Needless to say, there is not a lot of fishing to report of late. The clear and cold weather has offered some sunny days and glassy seas…would be beautiful fishing if you were able to get out to it (and maybe worth a shot if halibut was open for fishing). But for now, we continue to wait by the warm woodstove until the ice thaws, the fishing season opens, and we can once again get out there and chase down some Port Renfrew fish. 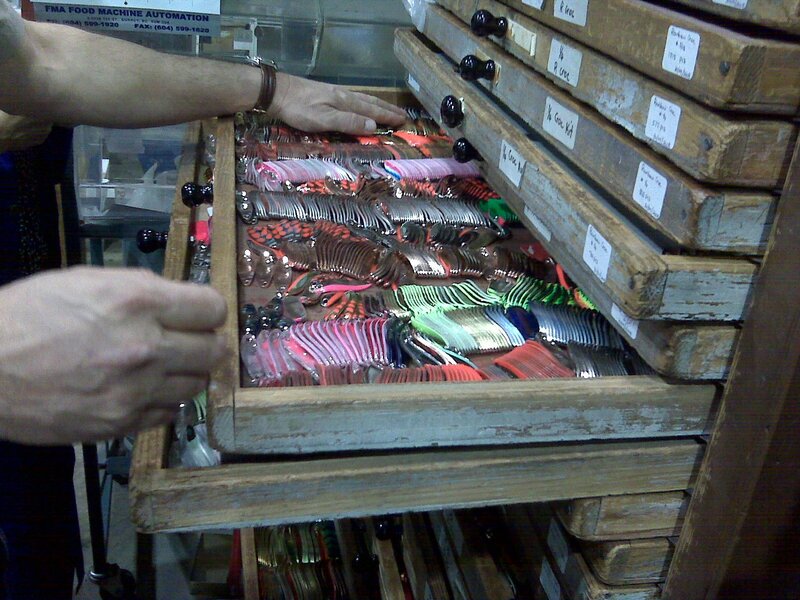 In the meantime, I recently got invited to tour the factory of the Gibbs/Nortac Fishing Tackle Company in Delta, BC. 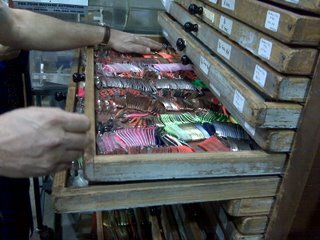 Gibbs makes many of the lures, nets, and other fishing gear that we rely on for our fishing efforts, so it was fun to see where it all comes from. Like most fishermen, I am an obsessive gear-head, so I was like the “kid in the candy store” surrounded by mountains of it. Syd Pallister was my guide. As owner and president of Gibbs/Nortac for many years, he lives and breathes fishing…although with a busy factory, he unfortunately spends too much time gear making rather than gear using [and with busy times all around, that sounds all too familiar!]. He’s got some pretty good fishing stories though. The factory is housed in the old French Pavilion from Expo’86. Surprisingly big inside, it accommodates more than 30 full-time staff manufacturing and warehousing many thousands of fishing items. Several of the staff I met have worked there for 20 years or more. 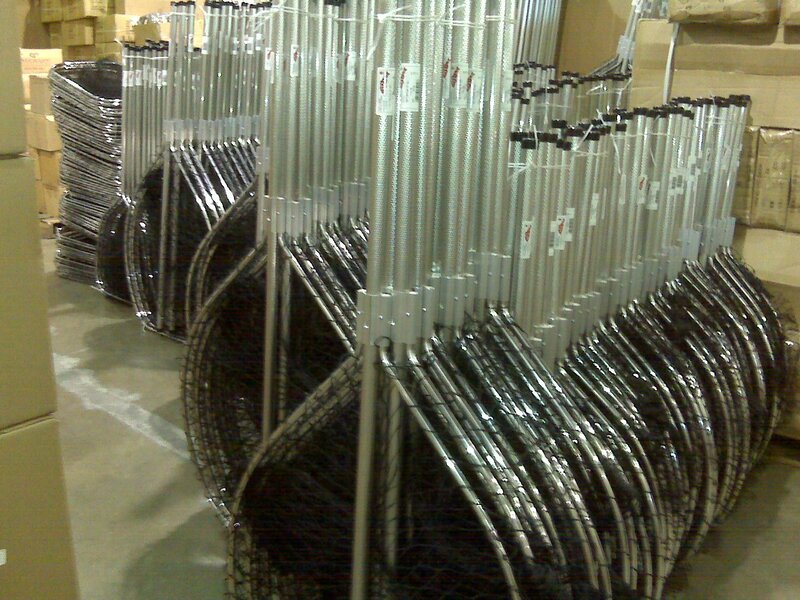 I was surprised by how labour intensive it is to produce the gear we fish. Take a spoon for example – the many steps include stamping it out of sheets of brass and copper, shaping, polishing, drilling, adding split rings and hooks, and so on. The painting is done by hand with air brushes, each colour and pattern a separate pass with the air brush. In the end, the lure passes through probably 20 hands before it is finally complete…eventually to be sold for $11 at your local fishing store. 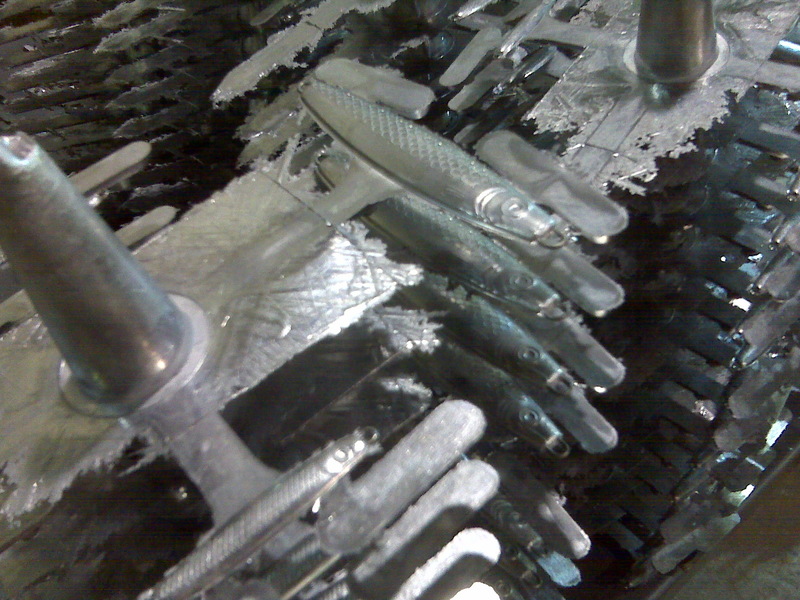 The lead jig lures are made in big molds that do many at a time. It was interesting too to see the equipment for bending the aluminum poles into nets...with everything set up to go and with the well-trained staff, it only takes a few minutes per net. Also impressive was the science behind all the different metal shades and colours on spoons. Through a series of electrically charged chemical baths and different sanding and polishing, a raw piece of metal is magically transformed into the variety of finishes you see out there. The process is probably reasonably straightforward if you had the time to think about it, but the science behind it seemed pretty complicated to me. I will leave this to the experts, and instead let them know how it fishes. In the end I left with a chartreuse glow “Farr Better” flasher to try out in Port Renfrew’s waters this summer. This flasher has a release, so that when the fish bites the flasher is no longer in-line – meaning you are fighting the fish, rather than the flasher. I expect this will work well in fishing deep for Springs on Swiftsure Bank this summer – I look forward to giving it a go. Syd is also on the Board of the Sports Fishing Institute of BC, so he passed on some information on what they are up to. This organization speaks for all recreational anglers in maintaining and improving sports fishing opportunities in BC. They deserve your support! Check out their website to find out more about what the Institute does, and consider getting involved either by joining or through a donation. Best wishes to you all...stay warm and think happy thoughts for the fishing Port Renfrew will once again offer up in just a few short months.